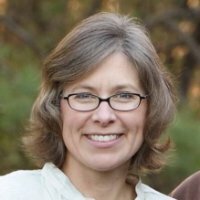 Susan Hobby is a member of the HoCoPoLitSo board. Look for her Lit Up column here on the HoCoPoLitSo blog. A play about three generations of stress in one household sounds like a downer: a divorced workaholic mother; two sisters, one shy and slightly chubby, one an embittered vet who lost her left hand in Irag; plus a grandmother dying of cancer. So what are Marilyn Monroe and Jane Russell doing up on stage vamping while the ladies toss back wine coolers and wear neon wigs? I’m eager to find out. 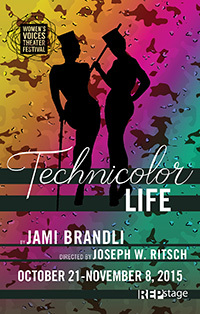 Rep Stage is producing the world premiere of Technicolor Life, by Jami Brandli, that centers around this mainly female family. Maxine, a slightly awkward freshman in high school, just wants to help her sister, Billie, who returned from Iraq with no left hand, plus the psychic wounds that come from combat and military sexual assault. Maxine’s mother is an overworked attorney who drinks a bit too much, whose husband left her for a younger woman a few years ago. And Franny, Maxine’s grandmother, shows up afte r being kicked out of the assisted living facility where she had been living. Turns out, she’s dying of cancer. But she’s also a live wire who insists the family do things together before she kicks off. So they watch old movies — especially Gentlemen Prefer Blondes — and work makeover miracles. Billie’s not having it; she runs 10 miles a day and slurps from her “water” bottle of vodka to kill the pain. Maxine, with the help of her new imaginary Blonde friends, finds Billie a fellow vet to date, and finds her voice. Meanwhile, Franny is arranging her euthanasia with Canadian drugs and her going-away party. Throughout, high school student Maxine practices her vocabulary words (serendipity, debonair, unique) and does reports for school on amputation, assisted suicide and turret gunners. Doesn’t sound like a barrel of laughs, but the play reads tragic comedy. Things do get better. The play captures the awkward efforts of Maxine, the rage of post-traumatic stress syndrome, the yearning for connection between family members. An ingenious part of the text — since I haven’t seen Technicolor Life staged, I have to imagine it — is the “playing field,” a real space onstage that illustrates the imagination. The playing field becomes a dance floor, a makeover space, Iraqi combat reenactments and even Internet dating site brought to life. Part of the Horowitz Center’s “Year of the Woman,” Technicolor Life runs Oct. 21 to Nov. 8 in Rep Stage. For tickets visit www.repstage.org. By hocopolitso in Uncategorized on October 20, 2015 .